I don’t believe in the saying that you “have to spend money before you get money”. No! You can actually make money (even more) without investing a dime. Let me tell you something… You can make as much as $100 everyday online without investing anything. Don’t believe me? Read on to discover what I mean. Yes! I know you may not have the money to buy a custom domain for now. 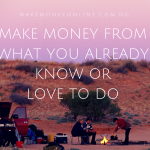 I know you may not have enough money to pay someone to create a website or blog for you for now. I also know that you may not have money to pay for any online advertisement. These are ways people spend money when they create a blog or website. But the good news is that you can actually make money online without any investment. What I mean is that, you can make money online without paying any money. You don’t have to pay for anything. Yes! So many successful bloggers have done that before here in Nigeria and elsewhere. A typical example is Linda Ikeji, the owner of lindaikeji . blogspot . com. Let me tell you something! She has not bought a “PIN” to develop this blog. Everything on this blog is “FREE”. Absolutely FREE! The domain name is FREE. The theme is FREE, the articles are FREE. Everything there is FREE! But she is the most popular blogger in Africa for now. Her blog makes money more than any other blog in Africa. Yes! I mean it. Another blogs that were started completely free are Allgist . blogspot . com and KevinDjakpor .blogspot .com. Both of them were later upgraded to a custom domain blogs but still with FREE Hosting. Sure, they are spending a token of $15 or less to renew the domain name every year while they make $300+ everyday only from Google AdSense. These are big blogs but they were started FREE without any investment of any sort. Yes, that’s the fact. In 2012, I created my first free blog on WordPress . com. I actually used that free blog to learn blogging. It might interest you to know that I first sold my information product on that free blog before migrating to paid version. So, it’s not necessary that you spend money before you make money. You too can make money online without any investment. All you need is correct knowledge on how to start. 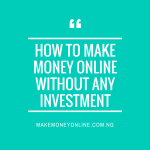 In the previous lesson, I thought how you can make money from Konga Affiliate marketing business. That post sparked a lot of conversations and interest. Sure, you can start Konga Affiliate marketing business without any investment. Someone asked about this in the comments section of that lesson. Here is another important lesson – how to make money online without any investment using free blog. What you will learn from this lesson. WOW! That’s a lot to learn from one lesson. So, sit tight let’s row the rail. Please don’t skip any line. You can visit this page anytime to read and re-read it so that you can gain full understanding of what I mean. Again, if you have any question, scroll to the comments section and ask your question. I will endeavour to give incisive answers to them. Before you even think of starting a free blog, give yourself sometime to think about the topic you want to blog on. This is called blogging niche. It’s not all the topic that is profitable. Here, I am going to suggest few profitable blogging topics for you. There are various sub-topics under those topics mentioned above that are still uncompetitive. So, you can make it fast if you explore more on these topics. Also, they are other hidden profitable blogging topics that are still not written on yet. I will deal with this issue on another training session. So, how do you choose a good topic to blog on? If you can put all these into consideration, you will be able to come up with a killer blogging topic idea. This will become your blogging niche. Ability to choose a good blogging niche determines your success rate. All those successful bloggers I mentioned before started blogging for free using blogger. Blogger is a free blogging platform owned by the big G – Google. Some of you might have known blogger before. But if you don’t know blogger, follow me carefully, because after this time, you should be able to create your own blog for free. What you need to create a free blog. Any of these will do. In fact, you can do this in a cyber café. Although, you will need to spend much time to develop it to the stage in can make money. If you are sure that you have all those things I mentioned above, go ahead and create your own free blog. Here are the steps (for absolute beginners). WOW, that’s very easy. If you have followed the steps above, you have successfully created your free blog using blogger. This is where you will have a little challenge if you are fairly new to blogging. But believe me, there are a thousand and one tips out there on how to customize your blogger blog to have a professional feel. Listen carefully! This is, and will be, the best advice you will ever hear if you want to make money online from blogging without any investment. I earlier pointed out the features of a good blogging topic. I included good knowledge of the topic and passion. Why am I saying this? If you choose a topic that you fully understand and have passion for, you will be able to create original articles without referring to any external source. 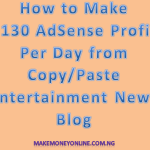 If you are just starting your new blog, you may need to make money from it with Google AdSense. For me, I make at least $50 from Google AdSense every day. That’s a good money if you convert it to Naira. Sure, you might have heard that it’s not easy to get Google AdSense account. Yes! It’s not easy. Google AdSense team need original and well resourced articles before they will approve your account. So, there is not joke if you are just starting a new blog. You may have to start well with original articles so as to get the approval. 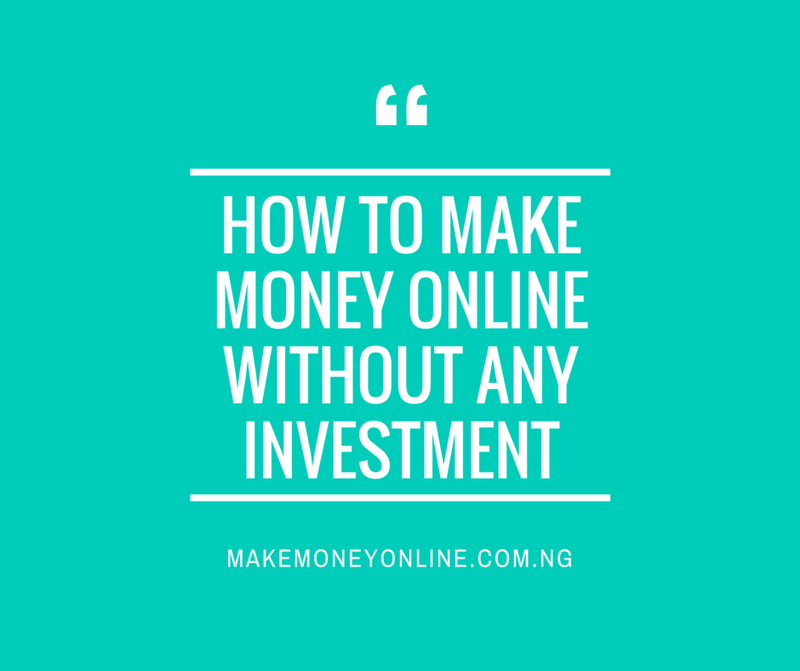 After that, you can join the Ikeji’s way of life and do what they do online to increase your income. Don’t worry I will teach you more on this in subsequent training. So far so good, you can see that you can actually create a blog for free. 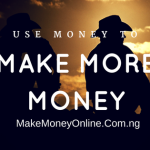 With this free blog, you can make money online without any investment. 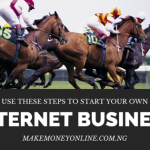 There are various ways you can make money from your new blog. But make sure you grow it to the level it can actually make you money. Don’t quit too early. It takes time to grow a blog. Blogging is not a get rich quick game. Blogging is a business and you need to build it up. Sure, with good effort it will bear good fruits for you in the future. Google AdSense: You can make serious money from Google AdSense and its very good source of income to new bloggers. Affiliate Marketing: based on your blog topic, you can promote products or services that are related to it. When your readers buy from your link, you are paid a commission. Sell your own products: Also, based on your blog topic, you can decide to create a product and sell them directly to your readers. Here you keep 100% if the sales and profit. You can sell various information products to many people who need them. I will teach you how to create profitable information products that sale like mad. Start a membership blog: If your blog is very valuable, you can create a paid membership section where people pay you to become members of your blog. 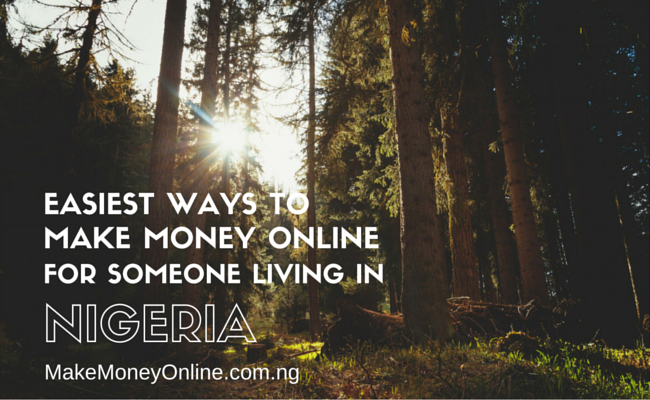 These are just few, there various ways you can make money from your blog. I will be revealing more of them to you in due course. In fact, that’s the essence of this training. So, if you are not yet in my training list, consider registering yourself now. More training is on the way. If you have any question on this topic, ask me in the comments section below. I will answer them asap. For a token of appreciation, remember to ‘LIKE” and “SHARE” this post on Facebook. See you lata! thanks, for your efforts to help us new bloggers. I really appreciate it . My question here is that you have list the ways we can make money out of blogging, but how are we going to make the money or get the money into our bank account? Hello David, blog money is paid firectly into your local bank account. 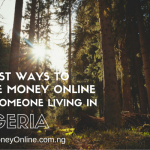 Read this post: How does Blog Money Get to Local Bank Account. Success! Ok buy a domain name here from naecheap or .ng from whogohost and map it to work with blogger. I will soon write a lesson on how to use custom domain domain with blogger. sir My Question Is Can Gionee Marathon M5 Android Phone Enable Me Setup A Blog And Do All Necessary Blogging?Because Other Expert Bloggers Do Not Recommend The Use Of Phones For Blogging Instead Laptop&destop Computers. Yes many people are still blogging with their phones. Most smartphones can do almost everything a laptop can do. After-all that’s why they are smart! Please Sir,can u help me customize my blog? Thanks bros for all ur blogs for free… At least u re doing your beat to eradicate poverty in Nigeria. I hope one day our government would recommend you for a national honor cos you deserve it.. Please Keep it up d sky is your starting point. I have a lot of questions to ask but let me just limit it to these for now. Yeah, there are values you will derive from a paid service that you can never get with a free service. Again, you may however wish to stand out from the crowed and decides to pay and get something different and more sophisticated. Thanks for your commendation. 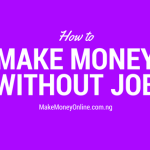 I will like to know how to make money through blogging. i know how to create a blog site and thats all i know but i don’t know how to make money by blogging. My question is where do i fill my account details and what do i do exactly to make me worthy of being paid. Please add me up on whatsapp my number is 08060818429. Thanks. I tried what you said but it brought out my google sign page, which i did signed in but i was told to edit my google account profile & nothing like a space for URL nor creation of new blog. sir, what do i do? Do you mean that you tried opening a new blogspot blog? please how can I add my own articles in my blog, or can you show me sample of blog so that I can understand more about this blog business. secondly how can I be pay for my niche blog? because i didn’t find a place to fill my bank Details when opening it. Good afternoon sir, i already have a blog, and is all about news, and entertainment, sport, fashion. But my problem is that i have not get Google AdSense so what can i do now. I will suggest you start niche blogging. Write original articles and apply for adsense, they will approve it. I do understand and appreciate your passion as I actually bought UI Post-UTME Past Question from you for my son in July this year. MY QUESTION: Is WordPress Blog and Blogger on the same threshold when it comes to Adsence Approval from Google? Or Blogger is better positioned to get approval since it is owned by Google? Thank you Sir, Yes – For quick AdSense approval, I recommend blogger with a custom domain. Bro,I think dis lesson b more clear and understandable if will can put d lesson into practical..moreover,hope blog doesn’t deals with codeing? Sure, there is no coding knowledge needed in blogging. Yes, the lesson are with illustrations and practical examples. So. to get the best of this lesson, you have to practice it and ask questions when you need clarifications. I will guide you. Success! Pls how can I post articles on my blog?